Sprint today announced the availability of a new Sprint iD pack that is aimed at making smartphones easier to use for seniors. The Active Senior ID pack includes 20 applications and services that Sprint believes can help to improve the smartphone experience for older users. For example, it includes access to WebMD, the AARP, MedsTimer, and a fall detector, among other services. The Active Senior ID pack is available on select handsets, including the LG Viper, Optimus Elite, and Marquee; the Motorola Photon 4G; the Samsung Galaxy Victory, Conquer 4G, Epic 4G, Galaxy S II, and Transform; the Kyocera Rise; and the ZTE Fury. The Sprint iD pack is free. In the wake of its courtroom victory against Samsung, Apple today asked the court to ban sales of eight Samsung devices found to infringe on its design and other patents. The devices include the Galaxy S 4G, S2 (AT&T and T-Mobile), S2 Skyrocket, S2 Epic 4G, S Showcase, Droid Charge, and Galaxy Prevail. Apple is hoping the court will grant a preliminary ban on these devices while seeking a final, permanent injunction barring their sale in the U.S. A San Jose jury found Samsung guilty of willful infringement of Apple's intellectual property and awarded it damages of more than $1 billion. Samsung is preparing to challenge the verdict. Boost Mobile today announced a handful of new devices from Samsung, the most significant of which is the availability of the Galaxy S II 4G, a Boost-branded version of the Galaxy S II, Epic 4G Touch offered by Sprint, including WiMAX. It will be available September 6 for $369.99. 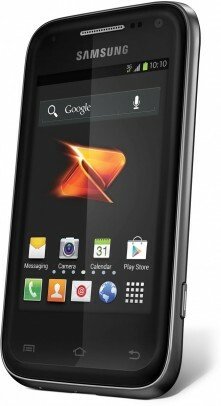 Boost also announced the Samsung Galaxy Rush and the Samsung Array. The Galaxy Rush, a mid-level Android 4.0 Ice Cream Sandwich phone, which has a 3.5-inch touchscreen, 3-megapixel rear camera, and 1.3-megapixel front-facing camera. It will be available in the late September for $149.99. The Samsung Array is a feature phone that has a sideways slide-out QWERTY keyboard. It features a 2.4-inch display and a 2-megapixel camera. It will also be available in late September for $59.99. The Array is also coming to Sprint, and to Virgin as the Montage. Sprint today indicated via its support forums that owners of the Samsung Galaxy S II Epic 4G Touch have something to looked forward to: Android 4.0 Ice Cream Sandwich. The update can be installed over the air, and Epic 4G Touch owners will be notified when the update is available to their device. Samsung today announced the availability of TecTiles, small, programmable near-field communication stickers that can be used to activate certain actions on NFC-equipped smartphones. Using a separate Android application, the tags can be programmed to change device settings, such as join a Wi-Fi network or set the phone to silent; to initiate communications, such as a text message or a phone call; as well as to interact with social networking sites, such as to set Facebook status updates or send a message to Twitter. Users hold the phone against the tag, and it registers with a quick vibration, letting the user know that the phone read the tag. The TecTile tags can be programmed multiple times. The TecTiles work with a number of Samsung phones, including the Galaxy S III on AT&T, Sprint, T-Mobile, U.S. Cellular, and Verizon; the Galaxy S II on T-Mobile; Galaxy Nexus on Verizon, Sprint and global; the Nexus S 4G on Sprint; and the Galaxy S Blaze 4G on T-Mobile. The TecTiles are sold in packs of five for $14.99, and can be purchased at AT&T, Sprint, T-Mobile USA, and Verizon Wireless retail stores. The TecTile Android application is available for download from the Google Play Store. Sprint today announced the Samsung Epic 4G Touch, the first Galaxy S II phone to launch with a major US carrier. The phone sports a massive 4.52-inch Super AMOLED Plus display and the Samsung Exynos 1.2-GHz dual-core processor. Other features include WiMAX 4G data, 8-megapixel main camera with 1080p video capture, 2-megapixel front camera, and fast Wi-Fi 802.11a. All new Galaxy S II phones also include extensive support for enterprise systems such as Exchange ActiveSync 14, Cisco VPN, and Sybase MDM. The Epic 4G Touch will be available September 16 for $199 with two-year contract.